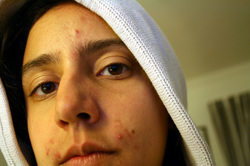 14.1 Picturing Jesus With Pimples. The “Second Week”: Week Fourteen/Session One. Theme: The Hidden Life of Jesus. Our reading for today: Luke 2: 39-40. As we stated last week, St. Ignatius suggests that those of us joining him on his adventure through the Spiritual Exercises, stop regularly along the way to contemplate the stories surrounding Jesus of Nazareth. Ignatius talks about using our holy imagination as we ponder the New Testament texts, placing ourselves smack-dab in the middle of the stories we are reading. As I see it, the Christmas stories, which we’ve just completed, are fairly easy for us to imagine. I mean, who can’t picture themselves standing amongst the lowly shepherds at the manger, or watching the wise men from the East bow in reverence before the newborn babe? But this week, our assignment is to contemplate the ‘hidden years’ of Jesus. Father O’Brien, in our excellent guidebook The Ignatian Adventure suggests that we “ask the Spirit to show us what Jesus was like growing up. (Accompanying our Lord) as a friend, relative, or neighbor in Nazareth.” In other words, I guess this week we can just let our imaginations go with Jesus. Now this could be fun! So what was it like for Jesus, growing up as a child in small-town Israel? Did He enjoy hanging around His dad’s carpentry business in Nazareth? Did He learn to use a saw and a hammer just like you and me? What was the first piece He made? A Christmas ornament for the tree made out of popsicle sticks He cut Himself? Or what about the times He was working on a project Joseph had assigned Him? What about the times He’d hit His thumb with that big hammer? Did Jesus cuss? And if He did…did He take His own name in vain? Whoops. I got off track there. Sorry. We do know for a fact that Jesus eventually had other siblings around the house. So what was big brother Jesus like? Did He share a room with His brothers? And did they fight and argue like most brothers and sisters do? Did they throw pillows at each other, tell ghost stories at night, and pick their noses? In other words, was Jesus a typical kid? Hmm. Did Jesus have pimples? Sorry. I did it again. So what about His spirituality? Was Jesus a typical youngster who had to be coaxed out of bed each Saturday morning to go to synagogue? Did He really go through bar mitzvah and attend a Jewish grammar school? Oy Vey! And what about His grades? Did He ever flunk a math test, like I often did? So maybe I should put away all those adolescent thoughts about Jesus and His first date, Jesus and His first kiss, and especially, Jesus and His girl friend at the Nazareth drive-in movie theatre! Yikes. This is gonna be harder than I thought! Oh well, join us next time as we continue this part of our journey with the young man, Jesus! My prayer: Father God, this one is gonna be hard. I have so many religious obstacles that keep me from imagining the ‘real-life’ Jesus of Nazareth. Yet, I’m convinced that if I can allow my imagination to flow, with the help of Your Divine Providence, I can come in touch with the true Jesus…the fully human, fully divine Lord of all. Holy Spirit, enable me. For Your name’s sake. Amen. My questions to ponder: So as I allow myself to fully embrace the reality of a teenage Jesus, where can the Holy Spirit take me? If I give myself the permission to go there, what insightful truths can I return with? Truths that just might enable me to better appreciate the full humanity of my Lord and Savior, Jesus of Nazareth? This entry was posted in Our Ignatian Prayer Adventure and tagged Jesus, Nazareth by The Contemplative Activist. Bookmark the permalink.